That's all there is to it and you'll soon have a lovely set of unique gift tags... Happy making! It's Christmas Jumper Day on Friday 16th December so I thought I'd re-share the How To for my DIY Christmas jumper! 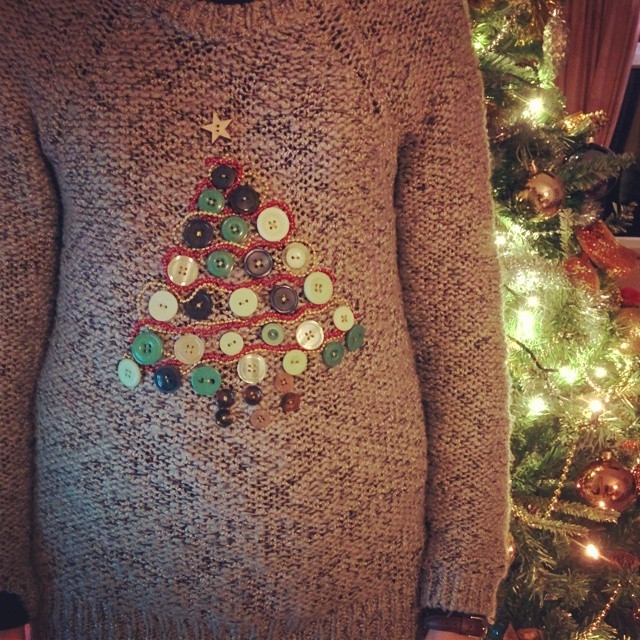 It's really simple to make using buttons and trimmings that you may already have in your sewing box and it gives a festive new lease of life to an old jumper. Find the how to here - if you make one, do share your photos in the comments, I'd love to see! I love the current trend for mega chunky knits knitted on huge needles- I've been admiring all the lovely cosy pieces that are popping up on Instagram- so I was really excited when Sirdar yarns introduced their latest product! Gorgeous is an ultra super chunky (think 20mm needles) yarn, in a 51% wool, 49% acrylic mix. It comes in 6 lovely colours and is so very soft! 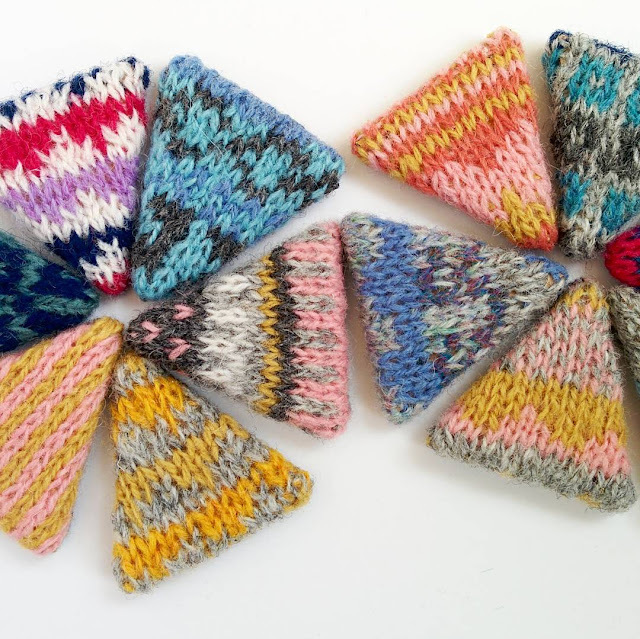 There are a range of patterns to go with the yarn, including cushions, blankets and even rugs, but as a bonus, there is also a free snood pattern on the ball band. 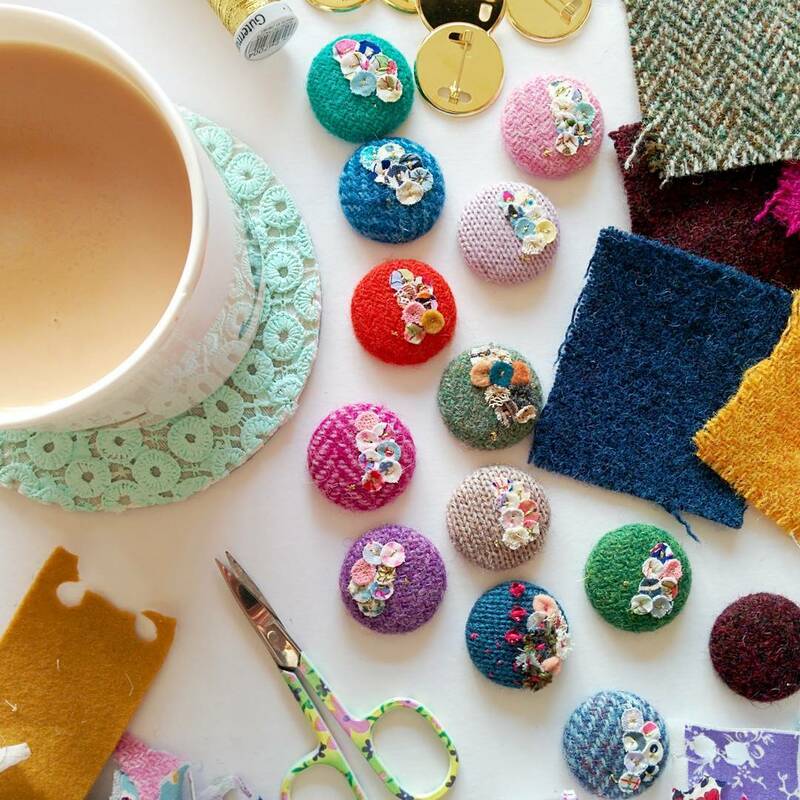 By day I work in an art and craft shop in the wool section (both brilliant and dangerous for a craft addict!) and when the Gorgeous arrived I couldn't wait to try it. 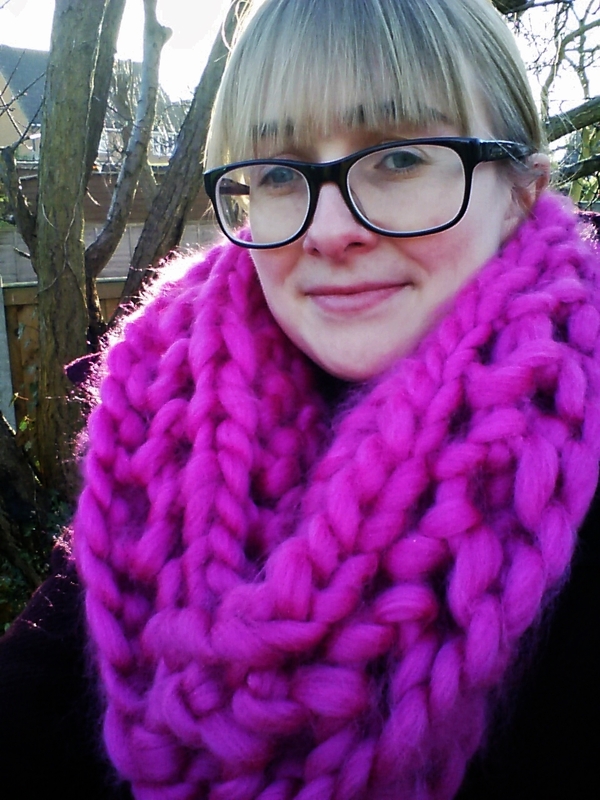 I picked out this beautiful bright pink shade and set to work knitting the snood. As you can imagine, the project grew very quickly and I was able to make the snood in an evening. 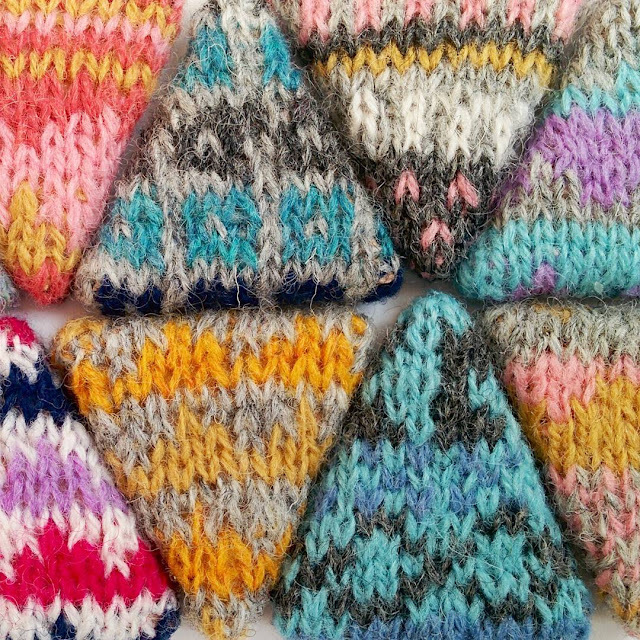 The pattern only requires one hank of yarn so these would make great Christmas presents! Gorgeous would be a perfect yarn for beginners to use- the patterns are simple and due to it's very chunky nature it's easy to handle, but it also has the wow factor to appeal to more experienced knitters. I thoroughly enjoyed using it and I'd like to make a blanket in it next. The Winter is suddenly looking very cosy! You certainly won't get cold wearing one of these! If you'd like to read more about Sirdar Yarns, check out their website here. Gorgeous is available in all good yarn shops, including my friendly local yarn shop, where you can also order online here. I'm so excited to be taking part in the Bust Christmas Craftacular in London, this Sunday 27th November. Find me there with around 70 other Designer/Makers and a fab line up of crafty workshops, live music and a pop up cafe and bar. 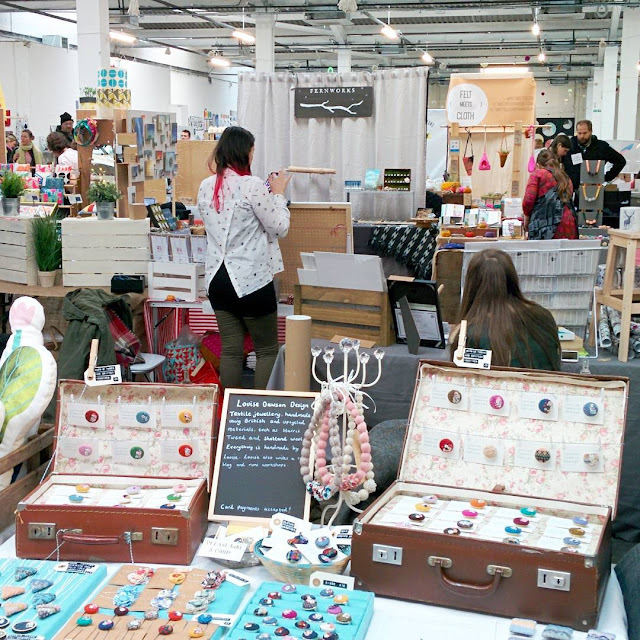 The Fair is taking place in the great venue that is York Hall in Bethnall Green and you're sure to find lots of Christmas gift ideas, as well as treats for yourself. 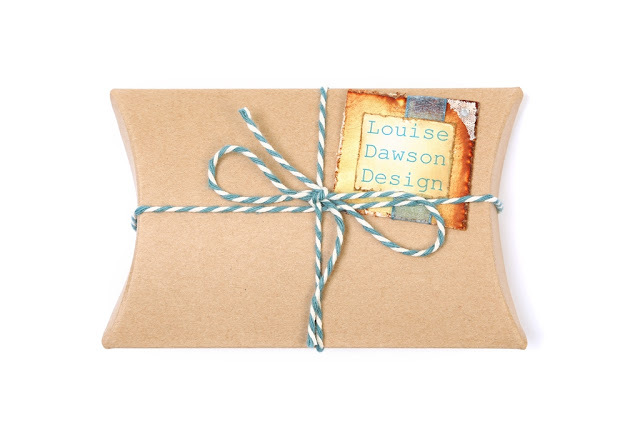 Find out more about Craftacular here. I would love to meet you there, pop by and say hi if you're planning a visit! A couple of weekends ago I had a stand at the fab Renegade Craft Fair at the Old Truman Brewery in Brick Lane, London. I really love Renegade because there's always such a friendly atmosphere among the diverse selection of makers that take part in the fair. I worked really hard in the lead up, making lots of new pieces. I'm really chuffed with my new table name banner from AllHerGlory The glittery packaging really made me smile too when the parcel came through the door! 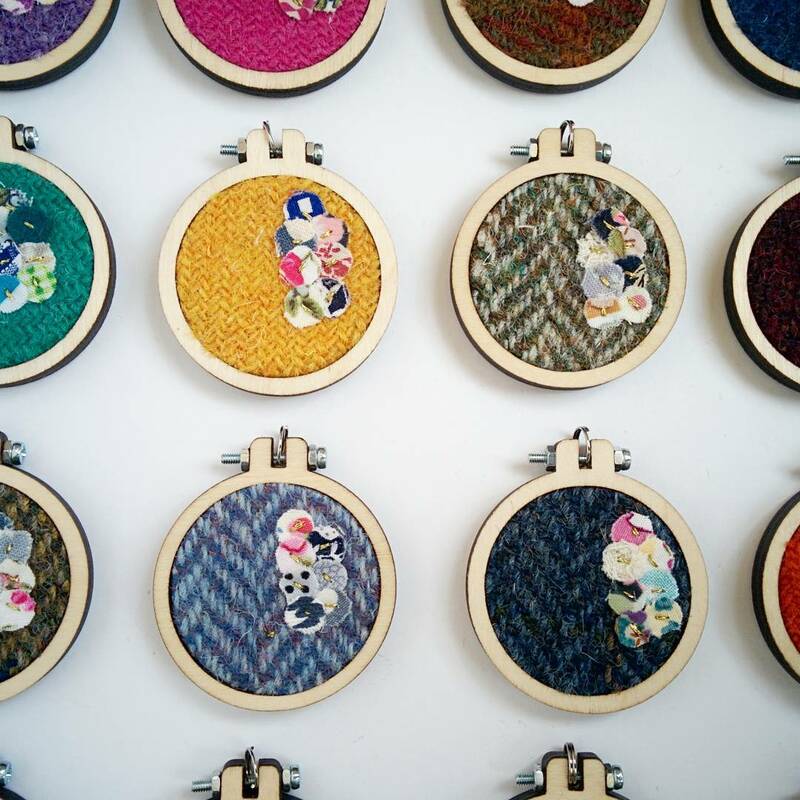 My Harris Tweed mini embroidery hoop necklaces had their craft fair debut at Renegade and I'm pleased that they were well received. 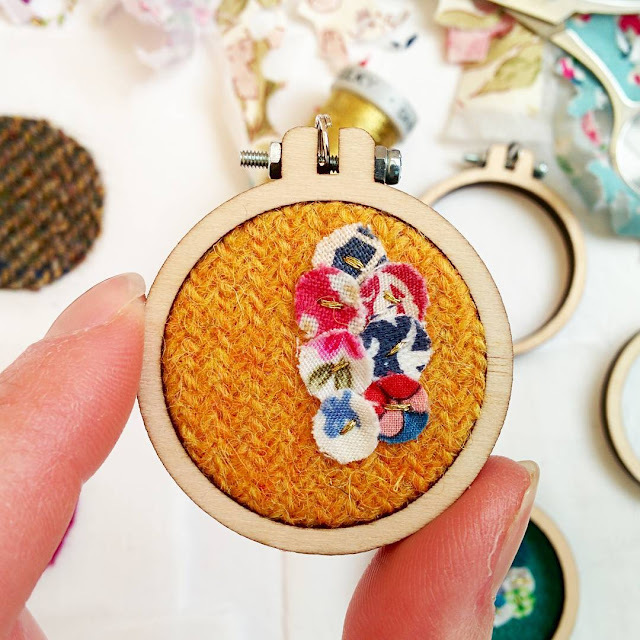 I got some new colours of Harris Tweed offcuts to use, but the mustard is still my personal favourite! 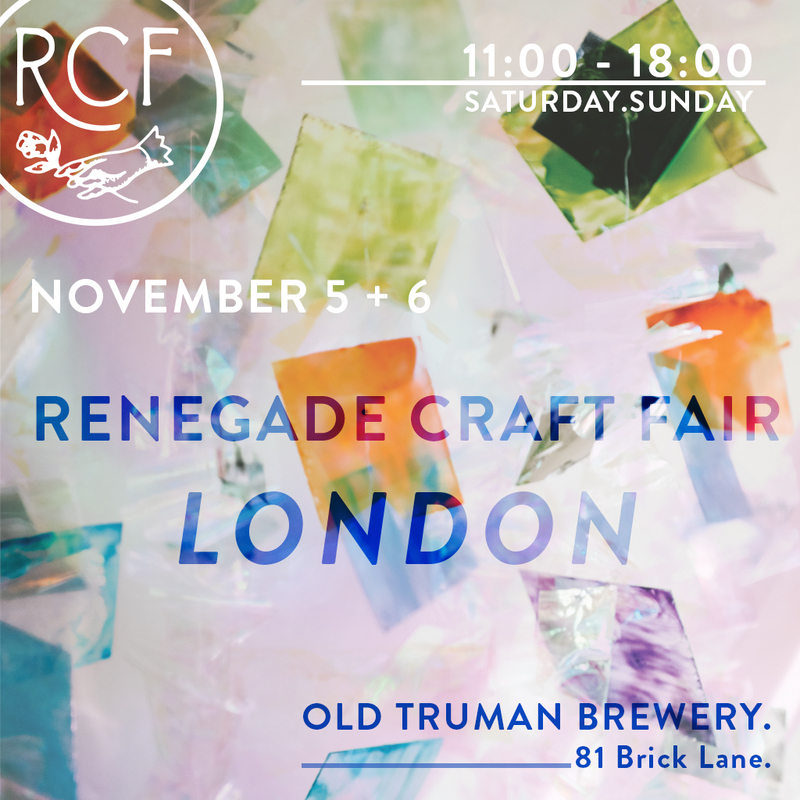 If you didn't make it to Renegade, I'll be taking part in the Bust Christmas Craftacular in London on Sunday 27th November. I'll be sharing more new makes and looking forward to meeting more of you there! I'm really excited to share with you that my work is featured in the latest issue of Homemaker Magazine! 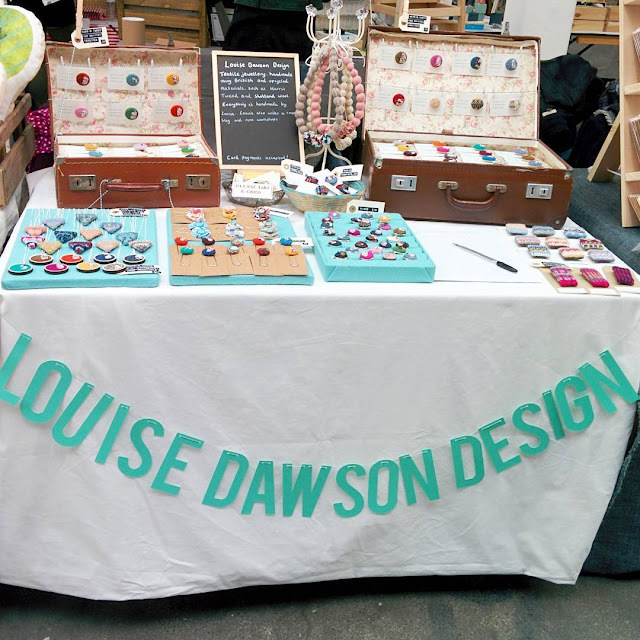 The article is all about the journey from when I started crafting as a child, through to the inspiration for my work today, plus insights into what's in store for Louise Dawson Design jewellery. I love the magazine so I was so chuffed to have my work featured. Thank you to all at Homemaker Magazine! Just dropping by today to let you know that I've just added three new Harris Tweed mini embroidery hoop necklaces to my Etsy Shop! 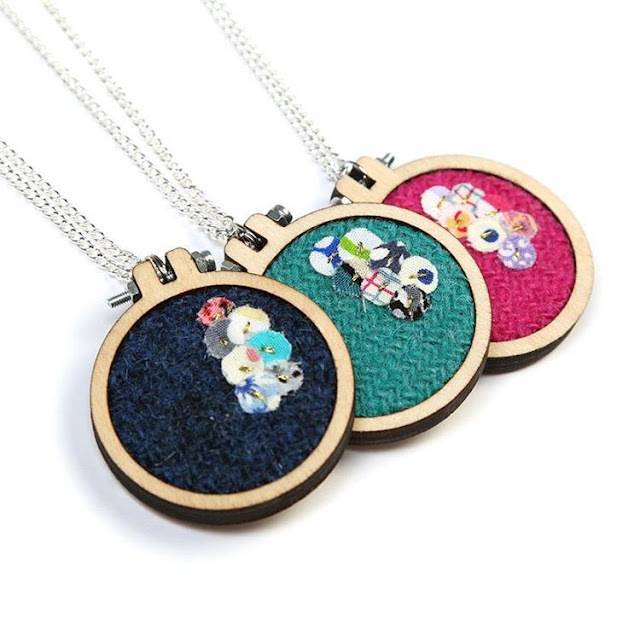 There's a lovely navy blue, sea green and bright pink and each piece is embellished with upcycled fabric pieces. They would make an ideal gift as they come with a beautifully hand decorated gift box, but would also make a great treat for yourself! I've got a navy blue one and it's my favourite accessory at the moment- they are very versatile and can be worn dressed up or down. Also available in mustard and burgundy Harris Tweed, take a look at them in my Etsy Shop and let me know what you think! I can even make you one as a custom order if you'd like one in a particular colour, just drop me a custom order request on Etsy. Some #wip for the fair! October is here, meaning it's officially pumpkin season! I thought it would be fun to get into the spirit and make some Autumnal themed decorations, so I set to work with my needles and came up with three knitted pumpkin designs. I used less than 25g of leftover double knit yarn to make the three pumpkins, so they are a great thrifty make and they make lovely stand alone decorations on a mantle piece or as part of an Autumn wreath. Happy Autumn and happy making! 9) Now to knit the stalk! The stalk is basically a knitted i-cord, which is most commonly knitted using double pointed needles (DPNS) . To knit the stalk in this way using DPNS, first cast on 5 stitches using the green DK yarn. Knit 1 row. Slide the work along to the other end of the needle and knit the next row. The working yarn will be on the left side of the work, but draw it across the back of the work and use it as normal. Knit 5 rows in this way, then cast off. 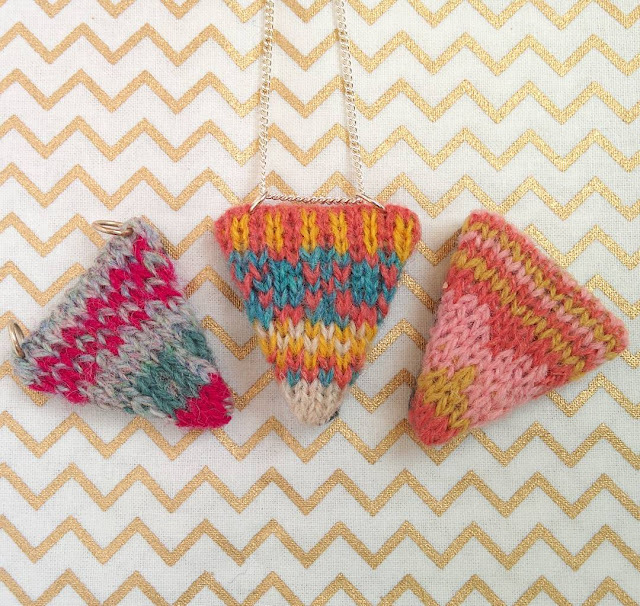 So that was the pattern for a basic pumpkin, but you could also try a couple of variation! * Create a "rustic pumpkin" by knitting the basic stocking stitch pumpkin to your desired size and then stuffing it. Instead of fastening off the yarn once you have drawn up the bottom of the pumkin securely, instead, thread the yarn tail onto a needle and draw the yarn up directly through thecentre of the pumpkin and pull the thread through the top. That's really all there is to it to make some simple but effective Autumnal decorations. If you knit some pumpkins, please share your photos in the comments! Enjoy!